Why not add more weight to this already sinking ship? Yeah, I couldn't think of a reason either. I think that's why this happened. ignore the nail polish that needs terribly to be redone. 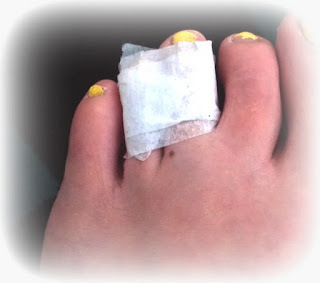 To those of you who don't know the history of my middle toe: it's long and boring. The gist of it is I have basically dislocated it three times and chipped the bone and now there is some kind of a cyst on the bone. Each time you dislocate it, it gets weaker. Hence this most recent picture. It got snagged somewhere between Rambo's oxygen cord and his diaper bag. Stinking baby. And it is excruciating. That's the best part. So now I am stuck limping in serious pain just to make it around the house. But it's all okay. No. Seriously. It's okay. Did anyone just believe that??? I really am making an effort to take this all in stride and make the best of it. Complaining isn't going to make it any easier. In fact, it will probably only make it seem twice as awful for twice the amount of time. I am, however, considering amputating it. Take the sucker off and cut my losses... get it? "Cut" my losses...... it's a pun....Take the Bible verse literally that says if it causes you to stumble cut it off. Yeah, that's what I'm thinking. ugh i hope it heals quickly! Ok, Amanda, I am trying not to laught and I do seriously feel bad, but it still is a bit funny. Find the humor girl... Find the humor! Love you and hope it heals soon!